The stage is taken by actors, actresses, poets and musicians. With Chris Cassone as the interlocutor for the evening and some musical friends. Start with a full house. 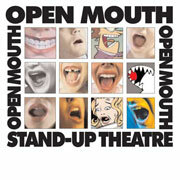 Dim the lights, let the stage be taken by actors, actresses, poets and musicians and you have our November Open Mouth Night. Chris Cassone acted as the interlocutor for the evening and brought along some musical friends. 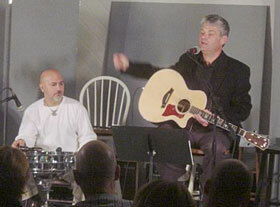 Chris, performing one of his own songs, was joined by percussionist John Arrucci, a frequent guest and performer at our events. Poet Margi Condyles was joined by violist Midhat Serbagi, John Arrucci and shakuhachi player Chris Merwin for two wonderful poems, one with music written specifically for the evening by Mr. Arrucci. Later on, singer-songwriter Mike Latini and bassist Jim Nowak took the stage and wowed the audience with three rather amusing songs. But it was Jazz/Blues guitarist Steve Schreiber that was the surprise for the night. Steve and his wife are regular volunteer workers at these events but we never knew he was so talented! James Shearwood was joined on stage by Midhat Serbagi for a reading of Tony Howarth's new play, "A Drink of Water". To close the evening, James Shearwood, accompanied by a full sound effects crew, read an updated version of "The Legend of Sleepy Hollow" which included a new song by Chris Cassone, "Scaredy Cat".